Lots of photos after the weekend I spent with Goldfinch in the city of Bath. 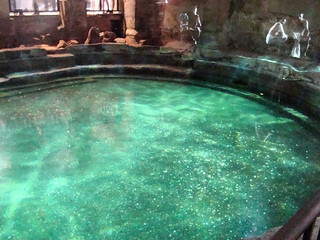 These are some of my photos of the Roman Baths…how could we not visit the Roman Baths…? It is a fascinating location…I was impressed by how much information was available…it took us over two hours to get round all of the exhibits listening to the information on the handsets they gave to us on our entrance. There was a lot of information about the worship carried out at the temple next to the baths. The have excavated so much, and there are even more renovations in process which will double the size of the site (I believe those areas will be open to the public in 2020.) Today there is a lot to see and learn, but back then it must have been quite an experience for the nose with the aroma of sheep or cattle on the altar and all of the essential oils being used for massages before bathers dipped into the waters. Quite redolent! 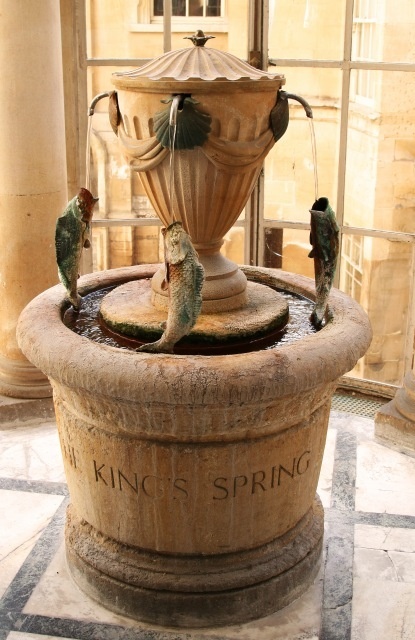 We were told that the waters that we looked out on, fed by a natural spring, may have fallen upon the Mendip Hills 10,000 years ago…that is how long it has taken to percolate through the limestone. 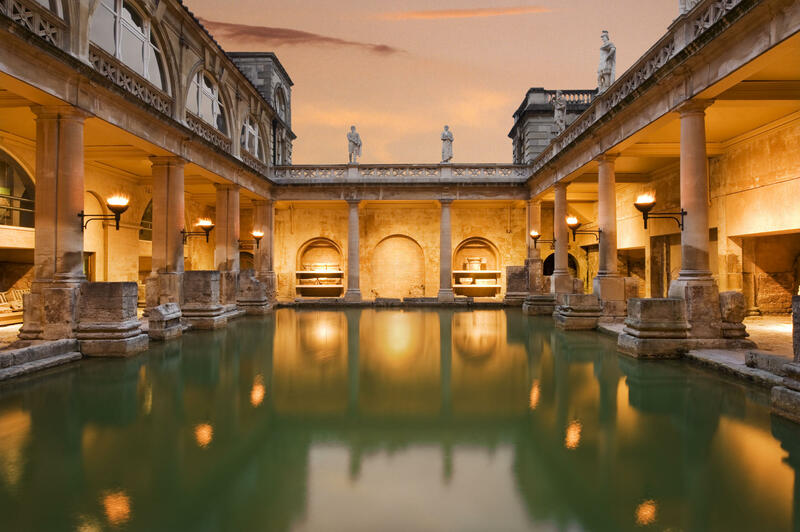 Although there is no chance of donning a toga or having a dip in the actual Roman baths, you are able to sample the water to drink, which has minerals and substances such as sodium, calcium, chloride and sulphate ions in high concentrations. There was a chart comparing the substances within the spring water to those in San Pellegrino and Perrier and other brands. It was rather lukewarm though! I have to say the temperature of the water made me recoil, but other than that the taste was not unpleasant. The waters from Bath’s thermal springs were not as salty spicy hot as my tears this past weekend. But enough of that nonsense…life is to be enjoyed…emphasis on JOY!!! Hard times…incredibly hard times at times…you have to seize ever scrap of wonderful you can and cling tight hold of it…life should be beautiful. Horde beautiful moments, treasure them. Who knows when you will desperately need them to help you through the hard times? Fascinating to see. Only read about this. Thanks for sharing. It’s funny I have been to Bath before but we have not been to the Roman Baths because it seemed a bit pricey…I am so glad we did. Really incredible. I bet it was wondrous to see with the human eye. You are right pictures sometimes do no justice to what we see. You did well though. I am sure I have not done it justice…it really is an amazing site to tour. Bizarre to think of it…they said the water we could see before us fell long before the Georgians who uncovered the Baths in the 19th century, and long before the Romans who built the baths. We had passes for the fashion museum, but we ran out of time! We were enjoying the full English breakfast at our hotel so much that we did not have enough time on Sunday to see all of the sites we would have liked to. Do you have a post about the fashion museum? We were offered the deal for both but opted for the Fashion Museum as that was my main reason to visit Bath. It was my birthday and I felt I couldn’t drag hubby around 2 historic sites. I will look at you posts as it was a shame we did not make it. Ruby, you would love the Roman Baths…I was surprised at how much there was to see…I am definitely going to return once they have opened up the new section in 2020.